Our Bullion Carriers expansion for Train Simulator 2015 is now available to buy in our shop. Priced at just £3.50 the pack contains Bullion Vans converted from Mark 1 BSK coaches and passenger rated Bullion Container Flat vehicles. 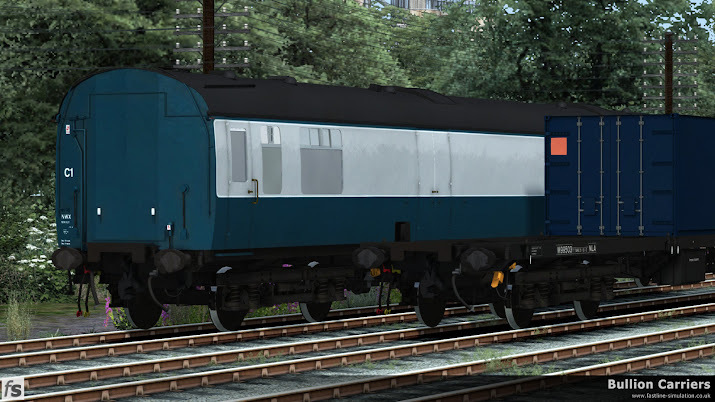 This Train Simulator expansion features some of the most secretive rolling stock used on Birtish Rail for the transportation of gold bullion and currency between bank centres. Converted in the aftermath of the audacious Great Train Robbery the vehicles offered greater security for their high value cargo and could be marshalled within timetabled passenger trains as a well as working as a special service. The pack contains both variants of the Bullion Van (TOPS codes NWA and NWX) and the Bullion Flats (TOPS code NLA) with blue and white containers in a variety of positions. The end of a train isn't complete without a tail lamp and the vehicles are supplied with rear versions carrying a traditional oil tail lamp. The expansion is completed with two scenarios for the Newcastle to York route (available separately) which will allow you to use the vehicles in Train Simulator straight away and a comprehensive manual in the style of a period document.